The Universe is a laboratory holding undiscovered knowledge that may spawn unimagined new benefits and entirely new industries. Astronomy is our tool for unlocking that knowledge. To preserve our ability to discover this new knowledge, we must prevent interference that blocks the Universe from our view. For optical astronomers, that means reducing light pollution of the night sky. For radio astronomers, it means preventing interference from “noisy” radio transmitters that spill over into our sensitive receiving systems. Using well-known and readily available engineering techniques, operators of communication and satellite systems can avoid interfering with radio astronomy. Just as we insist that industrial firms use good engineering to avoid polluting the air, water and soil, we must insist that firms operating radio transmitters use good engineering to preserve humanity’s precious window on the Universe. 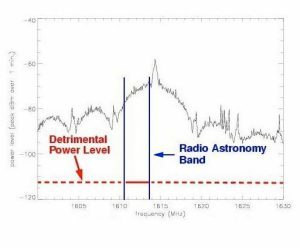 Why do radio astronomers worry about interference? On the left is a VLA image of a star. On the right is the VLA’s image of the same star when a satellite was passing within 25 degrees of the star’s position on the sky. The star’s data are swamped by the satellite’s transmissions. The radio signals arriving on Earth from astronomical objects are extremely weak — millions (or billions) of times weaker than the signals used by communication systems. For example, a cellular telephone located on the Moon would produce a signal on Earth that radio astronomers consider quite strong. Because the cosmic radio sources are so weak, they are easily masked by man-made interference. Possibly even worse than complete masking, weaker interfering signals can contaminate the data collected by radio telescopes, potentially leading astronomers to erroneous interpretations. What kinds of signals interfere with radio astronomy? By international agreement, radio frequencies are divided up into blocks, or bands, designated for different types of uses. For example, you know that AM radio stations all are within a certain range of frequencies that is different from the band of frequencies in which you find FM stations. Similarly, TV stations use different frequencies than, say, police two-way radios. These international frequency designations are designed to prevent one type of station from interfering with stations of another type. A number of frequency bands are allocated to radio astronomy. Because radio astronomers do their work with extremely sensitive receiving equipment, transmitting is generally prohibited in the radio astronomy bands. However, transmitters using frequencies near those assigned to radio astronomy can cause interference to radio telescopes. This occurs when the transmitter’s output is unduly “broad,” spilling over into the radio astronomy frequencies, or when the transmitter emits frequencies outside its intended range. Other interference arises because radio transmitters often unintentionally emit signals at multiples of their intended frequency. As use of radio for devices such as cellular telephones, wireless computer networks, garage door openers, and a whole host of other uses continues to increase, the threats to radio astronomy from inadequately engineered transmitters increases. A prime threat comes from transmitters in orbiting Earth satellites, since those transmitters are located overhead, precisely where radio astronomers must aim their telescopes to study the Universe. In addition, many types of equipment not normally considered to be radio transmitters, particularly computers or systems incorporating microprocessors, emit undesirable radio signals. How can interference be minimized? The black signal is from a satellite in orbit around the Earth. All satellite transmissions are supposed to be regulated by an international agreement to not spill over into the protected ranges used by radio telescopes. As you can see, this satellite was built to ignore those regulations. Good engineering can prevent or minimize interference to radio astronomy. Spillover from overly-broad transmitters and other unintended signals do nothing to improve the performance of a communication system. Technology readily available to radio engineers can eliminate or drastically reduce these unwanted signals that threaten radio astronomy. It is especially important that such interference-reducing technology be included in orbiting satellites. Radio astronomers do much on their own to minimize the effect of interfering signals, from locating radio telescopes far from urban centers whenever possible to designing their antennas and electronic equipment with features that reduce interference. Still, they need the help and cooperation of those who design and operate radio transmitting equipment to preserve our ability to gain new knowledge from the Universe. Communication between radio astronomers and other users of the radio spectrum is vital. 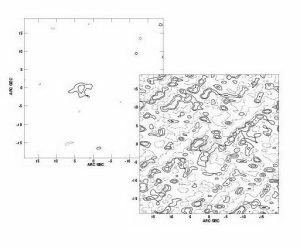 Engineers at radio telescope facilities often can help with suggestions for ways to minimize interference. There are numerous examples of situations in which a radio observatory and a transmitting facility have cooperated to implement a technical solution allowing both to achieve their objectives. For example, in 1958, the National Radio Quiet Zone was established to minimize possible harmful interference to the telescopes in Green Bank and the research facility in Sugar Grove, West Virginia. Preserving the ability to gain the scientific knowledge that can only be gathered by radio telescopes requires effort and resources. Given astronomy’s long history of contributing to human progress and the tremendous promise of future advances, this is an investment that will repay handsomely for all humanity. “Interference and Radioastronomy”, A. Richard Thompson, Tomas E. Gergely and Paul A. Vanden Bout, Physics Today, November 1991, pp. 41-49. “Light Pollution, Radio Interference and Space Debris”, conf. ser. 17, D.L. Crawford, ed., Astronomical Society of the Pacific, San Francisco, 1991. “Preserving the Astronomical Sky”, IAU Symposium No. 196, eds. R.J. Cohen and W.T. Sullivan III, Astronomical Society of the Pacific, San Francisco, 2001.